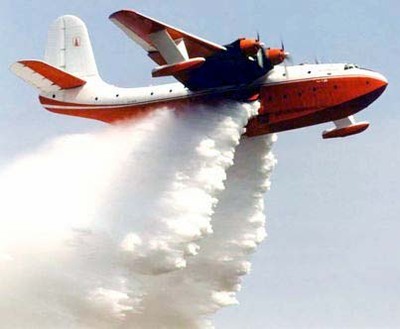 A Martin Mars Water Bomber is flying in from Canada to assist SoCal firefighting teams. This flying tanker plane can dump 7500 gallons of water at once, enough to cover a three-acre area. Witch Fire (now merged with Poomacha Fire), 10% contained, 12 firefighters injured, 2 civilians injured, has burned 225,000 acres. The quaint little mountain town of Julian, known for its fall apple-picking opportunities, is in serious danger. It has been evacuated and has lost power, and firefighters are working to redirect the blaze that threatens it. Scott had actually planned to take yesterday off work and take the family for a drive up to Julian. Does not sound like we’ll be making that trip this fall after all. The Poomacha fire is burning its way up Palomar Mountain now. Horno Fire at Camp Pendleton, 10% contained, 800 evacuees, has burned 6000 acres. This one shut down traffic on the I-5 earlier today, but I think it has reopened now. Harris Fire, the one south/southeast of us, has caused widespread evacuations but seems to have been somewhat redirected away from heavily populated residential areas. It has also burned its way eastward toward the Cleveland National Forest. Schools are closed, the courts are closed, and people like us in non-threatened zones are laying low, keeping the roads clear and avoiding the smoke. We had to cancel Shakespeare Club today, which crushed the kids. A small sacrifice compared to others’ losses, though! The footage of destroyed homes is devastating. (Tuesday) were just 200-300 yards away. The abbey is completely empty. the abbey as we have about 4-5 fire hydrants. We took refuge at St.
to return to the abbey." 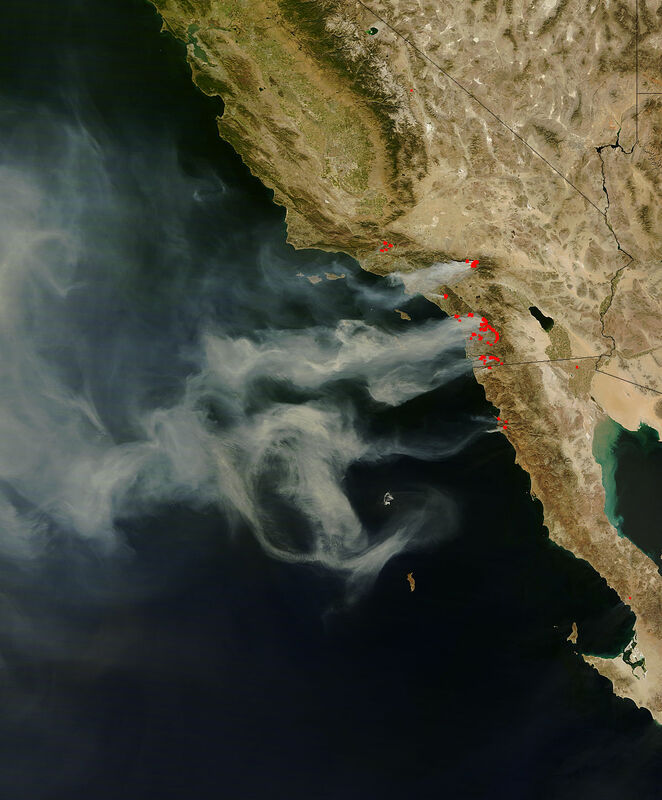 This aerial map image from DailyKos shows the smoke of all these fires swirling out over the Pacific. But I think now the winds are blowing mostly east? It’s the west-blowing winds, the Santa Anas, that have created this inferno. Mayor Sanders is trying to decide whether the Chargers will be able to play their Sunday afternoon game at Qualcomm Stadium as scheduled. I’m a little surprised there’s any question about it at all. Over 11,000 people are living at Qualcomm right now. Are they really going to be able to return home by Sunday? I would love to think so, but it seems like these fires are a long way from being under control. One of the Steele Canyon High evacuees I wrote about this morning has suffered a stroke and was taken to the hospital. Five people have died in connection with the fires: one in the Harris blaze, and four others during or after evacuation.